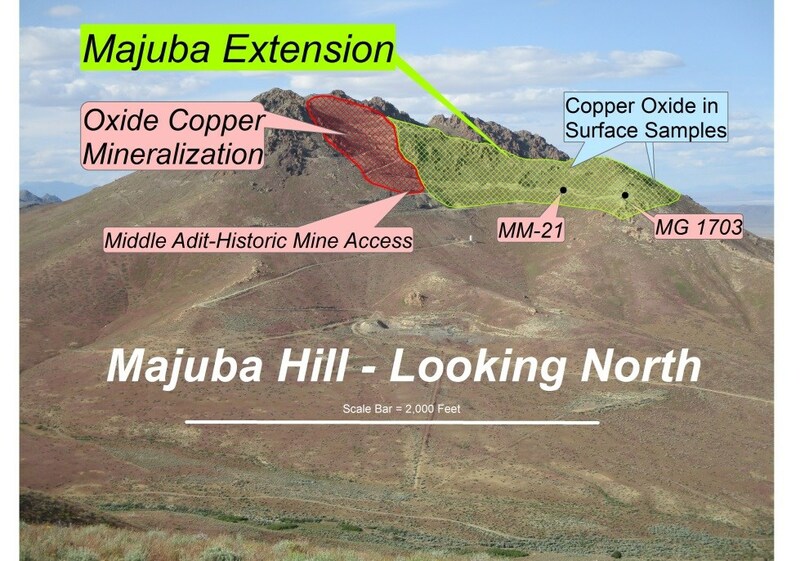 Vancouver, British Columbia--(Newsfile Corp. - April 11, 2019) - KOPR Point Ventures Inc. (CSE: KOPR) (OTC: NPEZF) (FSE: 4NP) ("KOPR Point" or the "Company") offers an exploration update on the Majuba Hill Copper Project. "The results of our previously announced re-assay of core from MG1703 have given our technical advisory board the clarity to review previous anomalous drill results around what we are calling the Majuba Extension. The Company now realizes that there is a major opportunity to expand the oxide copper mineralization at Majuba Hill that presents tremendous potential upside for our shareholders. I couldn't be more pleased or excited by what our technical team has done. The implications of what we have discovered in Hole MG 1703 which stepped out 1000 feet are of vital importance. Hole MG 1703 is the "Key-Stone" that allowed us to recognize the significance of the assay results from previous core hole MM-21 which has an interval of substantial copper oxide at the same elevation as the interval in MG 1703 -- 66.9 ft @ 0.71% Cu." (2) No more than 1 internal "waste" assay less than 0.05% Cu and intersection still has to be at least 0.10%. True width is unknown at this time. The oxide intercept in MM-21 is 300 feet north of the oxide intercept in MG1703. There has been no drilling along the top of the Majuba Extension ridge. This leaves a 600 to 800 foot thick zone between holes MG1703 & MM-21 and Copper oxide sampled near the top of the ridge. This undrilled zone is also directly above the high-grade sulfide intersections in MMX-24. The Company is currently fast-tracking plans for a drill program for 2019. The initial plan is to drill 16-18 holes as part of the ongoing economic evaluation of the surface oxide mineralization and the program will be a mix of Reverse Circulation (RC) and Core. It is anticipated that the total budget for the program (including third party 43-101 modeling) will be $610,000 USD. The drilling will be staged to allow more precise drill locations as the program advances. A significant portion of the drilling being planned will be done on the patented mining claims, which should shorten the permitting timelines. The Company believes that there is a high probability for expanding the currently modeled oxide copper mineralization beyond MG1703 and MM-21. This would result in a much larger mineralized zone of leachable copper close enough to the surface to be considered for an open-pit mining scenario. Sampling for MG1703 was conducted under the supervision of the Company's consulting geologist and the chain of custody from the project to the sample preparation facility was continuously monitored. A blank or certified reference material, was inserted approximately every 24 samples. The samples were delivered to Bureau Veritas Mineral Laboratories preparation facility in Elko, NV where they were crushed and pulverized. Resulting sample pulps were shipped to Bureau Veritas certified laboratory in Sparks, NV or Vancouver, BC. Pulps were digested using a multi-acid digestion and analyzed for copper and 34 additional elements using ICP-ES. Gold was analyzed using a fire assay fusion and an atomic absorption spectroscopy (AAS) finish on a 30-gram split. Data verification of the analytical results included a statistical analysis of the standards and blanks that must pass certain parameters for acceptance to insure accurate and verifiable results. E.L. "Buster" Hunsaker III, CPG, Chairman of the Company's Advisory Board, is the Qualified Person who has reviewed and approved the technical content of this news release on behalf of the Company. About KOPR Point Ventures Inc.
KOPR Point (CSE: KOPR) (OTC: NPEZF) (FSE: 4NP) is engaged in the identification, review and acquisition of latter stage Copper and Copper/Gold assets. Management has been mandated to focus on geo-politically safe and stable regimes with mining friendly jurisdictions and government regulations supportive of mining operations.